One of the most favored all-inclusive strollers, the Evenflo JourneyLite Travel System has basket-like storage space, trays for both parent and child, and a harness system. In addition to these, it looks outstanding, is made to be durable and mobile and promote navigation capabilities. Since it is a travel system, you can certainly understand how convenient this stroller can be on the move. 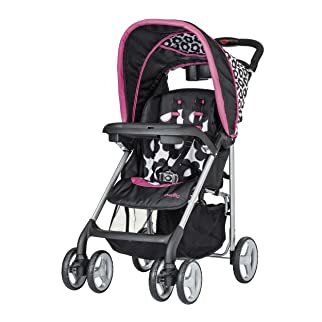 Way better than any umbrella stroller when it comes to functionality, this lightweight and efficient marvel of a product has a slew of superb features. Being a travel system, the product package includes the Journey 300 and the Embrace 35 Infant Seat. 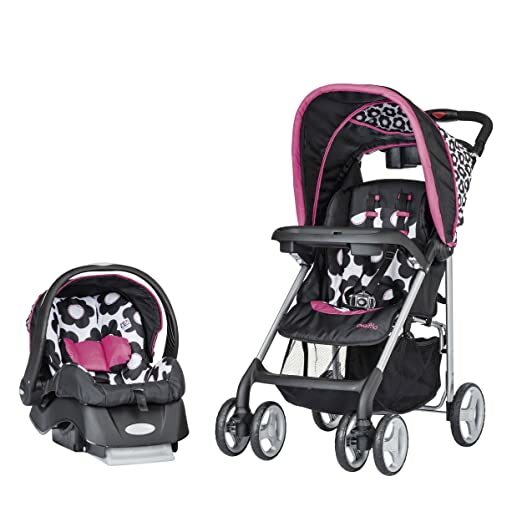 It has a separate stay-in-car base that makes it easy to transfer the stroller from home to the car. Maneuverability is enhanced thanks to the lockable swivel wheels up front. The multi-position reclining stroller seat is padded and quite comfortable. Designed to carry a child up to 50 lbs., the stroller also provides excellent mobility and ease of pushing and pulling. The child’s tray comes with 2 cup holders, and can pivot in and out for easy lifting and placement of the child. The push-twist handle fold mechanism is outstandingly convenient and makes for speedy folding/unfolding. It is capable of self-standing once folded. The car seat safety rating of the Evenflo JourneyLite Travel System ensures that you can use it for your baby from infancy to when they become a toddler. There is a practical 5-point harness to ensure safety. As for the infant car seat part of the product, it comprises a 3-point harness system along with an auto base and three shoulder harness positions. You have three gorgeous color themes for three different Evenflo JourneyLite systems: Carolina (Mariana color theme), Monaco (Koi color theme), and Penelope (Party Pink Koi color theme). Making everyday on-the-go tasks simple and hassle free, the Evenflo JourneyLite Travel System is heavy with quality and features and light to the touch. 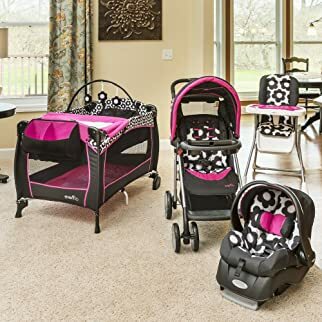 Offering a plethora of features for parents, this is one integrated travel system that brings both style, practicality, and comfort to your baby-care needs. The rear wheels have foot-activated brakes for each that ensure optimum safety at any time. They are operable even if you happen to be wearing flip-flops. The brakes serve to hold the stroller in place. The front wheels have special locks that face them directly forward. This way long distance strolls are simple and navigable without undue pushing and pulling required to keep the stroller going in a straight steady direction. Brakes do not work in tandem. There is one brake for each back wheel, so you can stop the stroller using whichever foot is free. This does not really make much sense because both wheels stopping at the same time will ensure heightened safety than simply having one wheel do it. The infant car seat has a 3-point harness system that is easy to buckle and unbuckle. Sadly, there is no adjustment for the crotch strap and the harness is not padded for comfort. A 5-point harness would have made padding and other features quite accessible, which boils down to Everflo being a little lazy in this regard. All in all, the stroller is quite stable from both the side and back. This means it passed with flying colors on the sideways and backwards tip-over tests. This safety feature more than compensates for any laxity on the part of the Evenflo JourneyLite Travel System. How Soon Can You Set It Up? It takes less than 15 minutes to have the whole travel system ready to go from package arrival time. The well-documented brochure has step-by-step instructions in case you feel you need guidance. One of the downsides to this stroller is that once it is out of its box it emits that classic chemical smell of ‘something new’. Gas it off outdoors or in the garage before you actually place your baby in. This question has to be asked because the very nature and core functionality of the Evenflo JourneyLite Travel System hinges on its renowned practicality. You have several storage spaces that make things convenient while shopping. Solely accessible from the rear of the stroller, the sizeable basket storage space affords plenty of room to hold your little angel’s essentials. A removable child tray is in itself a benefit but you can also pivot this tray out and back in to make things quicker where child lifting and placement are concerned. It is safer and less cumbersome to handle your child with the tray out of the way; now possible with the pivot feature. The tray is equipped with a cup and snack holder, adding to the stroller’s modern practicality. For the parent, there is a 2-cup tray at the double handles that also has a small covered compartment to store small items like keys and such but not big enough to hold, say, an iPhone. Fixed at 42 inches, the handlebar’s height cannot be adjusted. While this is great for most parents across the world taller parents might find maneuvering a bit difficult. The stroller’s rear is not so practical. It does not have enough leg room for the parent who will find that they sometimes hit the back with their legs as they walk with the stroller. The multi-reclining seats have angles that cover the range from 39 to 64 degrees. Seat padding is outstanding but missing a hard back for standard support. The canopy is wide and ideal but cannot stave off low sun angles. In addition, there is no peek-a-boo window or venting. 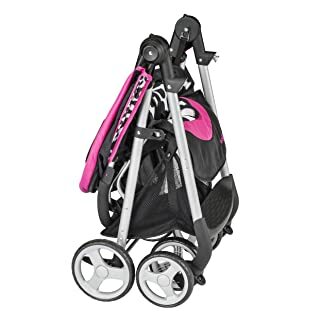 The perfect backup stroller or additional travel system that you can store at another’s house, the Evenflo JourneyLite Travel System has its shortcomings but packs several advantages that more than give this stroller value for money. Enjoying 4.5 stars on Amazon, you will certainly get features to complement the stroller’s worth.